When it is time to cut back on all those rich desserts of the past season, this is the perfect ending to a light meal. Use whatever fruit is available – I used kiwi, Clemintine oranges and raspberries. The key is to take your time in the cutting and presentation, it can be as elegant or simple as you want. To give the sauce more body, put the Greek yogurt in a fine strainer over a bowl in the refrigerator overnight to eliminate some of the liquid, which will make the sauce thicker. You may also use sour cream in place of the Greek yogurt, but do not use anything fat free, you won’t be pleased with the results. This can be served with a few Swedish ginger snaps on the side if you want to make it little more substantial. 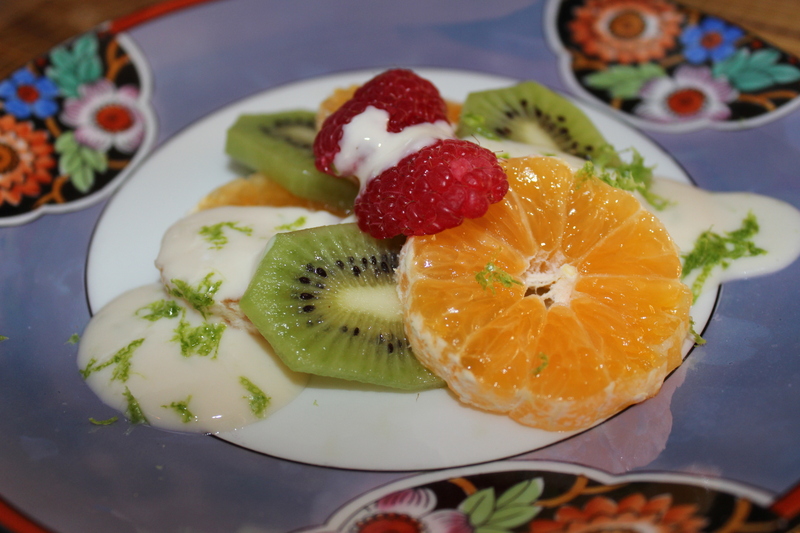 This entry was posted in Recipes and tagged dessert, fresh fruit, Greek Yogurt, lime, sauces. Bookmark the permalink. Delicious, nutritious and natural and healing! Thanks Emily, and happy new year! Happy New year to you too my dear and enjoy in good health!